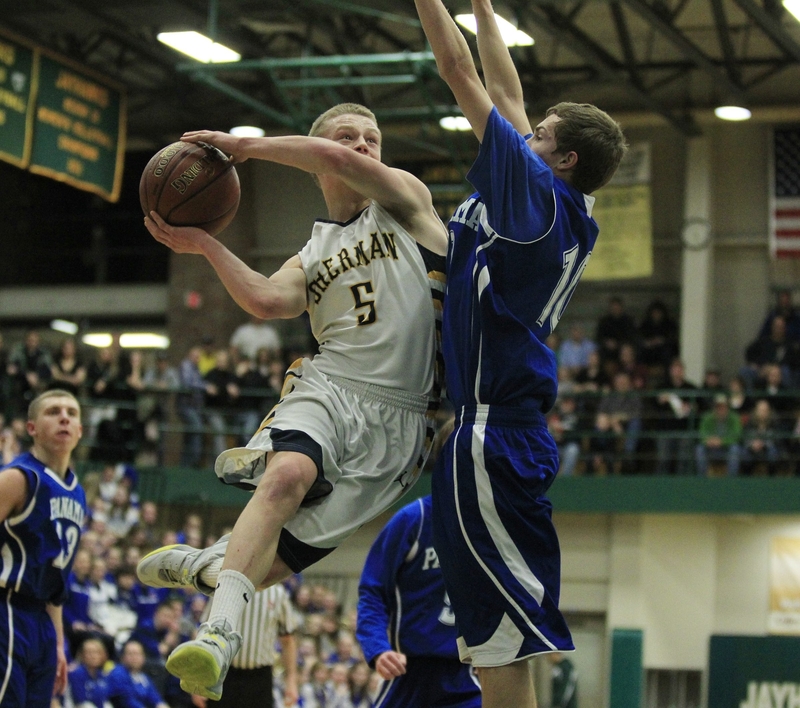 Sherman’s Devin Moorhead (5) drives to the basket on Panama’s Greg Delahoy (10) in the Class D final Friday. JAMESTOWN — At halftime, the best Class D team in Section VI all season, the defending champion which had swept its opponent during the regular season, was trailing. Jamestown Community College’s Physical Education Complex was packed – as it usually is for Championship Friday – with close to 2,000, and the blue-and-white-clad fans of third-seeded Panama cheered the Panthers to halftime with a three-point lead over top-seeded Sherman. The Wildcats did that with a 12-0 run in what would be a 20-11 third quarter as they moved to 20-1 and won its second straight Section VI Class D championship with a 67-50 victory. Sherman returns to the Far West Regionals, where it will play the Section V (Rochester area) champion at noon next Saturday at Buffalo State. Section V holds its Class D-1 (private school Batavia Notre Dame vs. Jasper-Troupsburg) and D-2 championship (charter school Career Mentoring vs. Houghton) today; its overall Class D championship is Wednesday. Sherman rode the wave of energy from its own blue-and-yellow, cape-wearing, suspender-snapping, clown-pants wearing supporters to an 11-2 start and a 20-15 lead in the opening quarter. Panama (15-6) stormed ahead with an 18-10 second thanks in part to two three-pointers from senior Dan Odell (eight points) and one by junior Dillon Mescall (10). Junior Greg Delahoy led the Panthers with 12 points while sophomore Chris Blose had nine. Sherman took control of the game as Robson had 10 points in the third, scoring in transition, hitting a three and adding follow baskets as junior forwards Jake Card (6-2, 14 points) and Nathan Ottaway (6-3, 12 points) established themselves inside. Sherman stayed in control of the game in the fourth, expanding its 50-44 lead after the third to 10 with just two minutes to go before posting a final score that wasn’t indicative of their battle.